This MacBook Pro (15-inch, Late 2011) A1286 MD318LL/A Precision aluminum unibody model has a 2.2 GHz quad-core Intel Core i7 Processor (2675QM). This MacBook Pro (15-inch, Late 2011) model has dual graphics processors – an AMD Radeon HD 6750M graphics processor with 512MB of GDDR5 memory and an Intel HD Graphics 3000 with 384MB of DDR3 SDRAM shared with main memory. 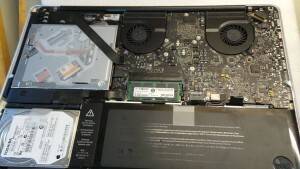 The customer had complained that the MacBook Pro (15-inch, Late 2011) A1286 notebook was experiencing unexpected system restarts, overheating, graphical and video issues due to a defective built-in discrete AMD graphics card. 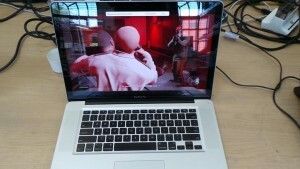 The Mac technicians at Creative IT London performed a reflow to the AMD Radeon HD 6750M graphics card and the notebook computer is working well. Call 020 7237 6805 for same day London MacBook Pro A1286 graphics card repairs and Apple MacBook Pro (15-inch, Late 2011) A1286 MD318LL/A AMD Radeon HD 6750M graphics processor repairs and to fix video issues, overheating issues and logic board failure.